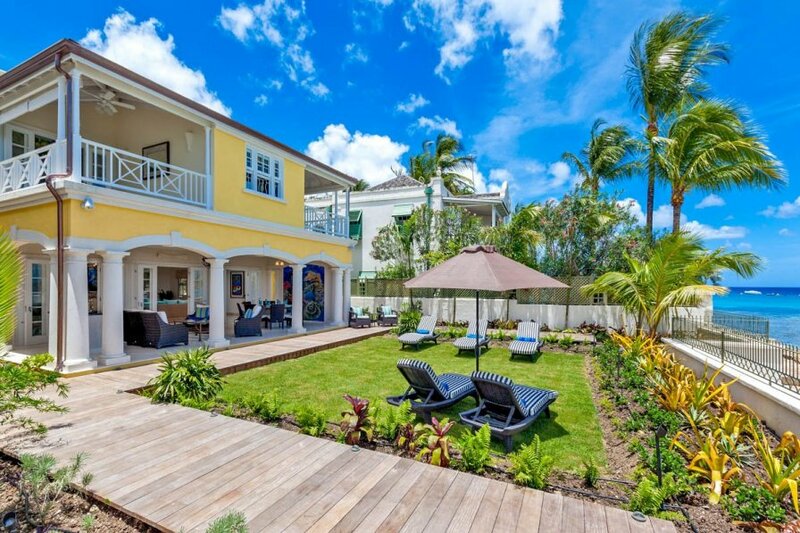 Let yourself truly relax and unwind in luxurious style at Villa Mosaic, a modern and stylish home away from home that is located on the ocean at Reeds Bay on the West Coast of Barbados. It's a bright and modern home with colourful touches throughout, starting from the mellow yellow hue that the home is covered in. It follows an undersea theme, with whimsical touches that add to the charm and excitement of this home. This five bedroom home away from home is spread over two floors, with the bedrooms all on the top level meaning two of the rooms have balconies over the ocean and garden. All of the bedrooms are air-conditioned, with ceiling fans and en suite bathrooms. This floor also offers a small television room, perfect for families with children who want (and need) their own time. On the ground floor is the open plan living area that opens out onto the covered terrace. The spacious living room offers plenty of cosy seating options, so guests can gather to de-brief over the day, read a book or join together for movie night - BYO popcorn. The villa has a very large, modern kitchen that is incredibly well-equipped. There is even a chef who prepares three meals a day for guests. As you wander the halls of this home, looking out onto the ocean, it's a very special feeling. Of course, a home that's located on the beach takes full advantage of the sun, sand and water. Whether you are taking a dip in the plunge pool, sunning yourself on one of the loungers that over looks the ocean or seeking respite from the sun under the covered terrace, you're relaxing in style. Villa Mosaic is a 5-bedroom villa with beachfront access to Reeds Bay and the use of a plunge pool. The villa has a large grass lawn area, which is particularly great for lounging around in during the hottest parts of the day. Barbados is a dreamy travel location boasting renowned beaches, stunning sunsets, a rich history and beautiful architecture. It's a popular travel destination, and with year round sun and an average of 3,000 hours of sun a year, it's no surprise. If you're travelling to Barbados chances are you'll want to explore countless beaches, spending days exploring the coasts, topping up your tan and seeing the evening come in at one of the beach bars. There are many beautiful beaches to enjoy, from Miami and Rockley Beach to Bottom Bay and Mullins Beach - the latter being one of the lost popular spots in Barbados. Many of the beaches offer sun loungers and have beach bars, so you can spend your days relaxing beachfront. There is of course more to the island than picture perfect beaches. If you head inland you can explore plantations and cotton fields, or visit the UNESCO-listed town of Bridgetown or take in the stunning architecture in Speightstown. Of course, no trip to Barbados is complete without sampling some of the islands internationally recognised rum, or their local specialty, flying fish.